The nature of what I do as a national evangelist and pioneer collective advisor is to travel quite a bit natioanlly. But there are two things that I am developing that help me remain rooted in all this pioneer stuff. 1. I am part of an emerging arts café centre in the village we live in Great Gransden. The hope is to build more community and church with people in the surrounding villages who are not part of church. 2. 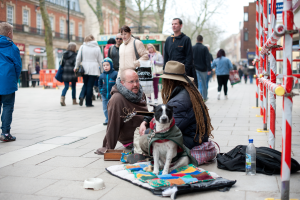 I am also part of a team who shares Jesus on the streets of Peterborough. This is varied but in it all I seek to find people of peace and lead people to Jesus. The challenge now is how to pioneer something new for people to belong to and be church.